Canyonlands National Park is located in southeastern Utah near the town of Moab. It is about 520 square miles in size and receives over 400000 visitors each year, many from other countries. The park sees mountain bikers, hikers, rafters, and four wheel drive vehicles exploring the area. The area is divided into four districts: Island in the Sky, The Needles, The Maze, and the rivers that flow through the park (Colorado and Green). Rainfall is less than 10 inches per year. Summers are hot and winters are cold with occasional rain or light snow. In the early days (1960s and 1970s), the park was not well visited and one could go for days without seeing anyone else. The road into the park was gravel and had many washboards. Park rangers were located in a small trailer parked next to the road. 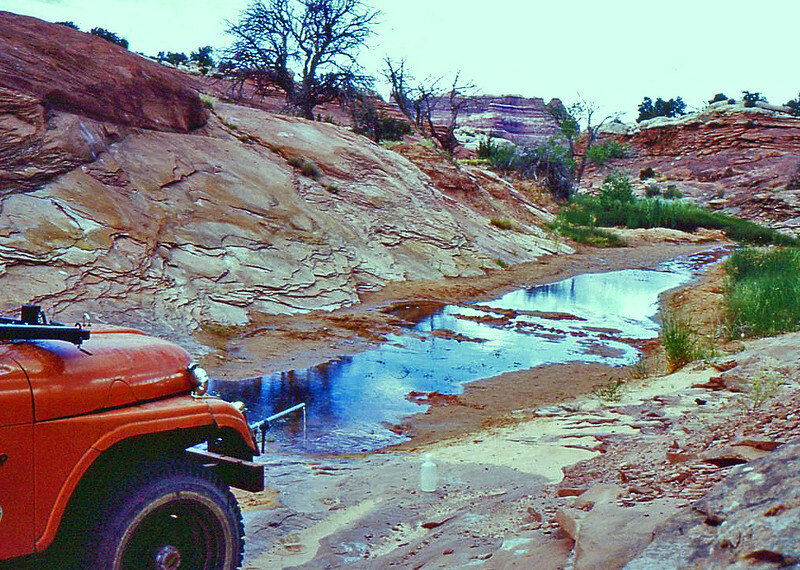 Travel within the park was essentially by four wheel drive vehicles and all existing dirt roads were open. Today, a paved road leads into the park and it can get crowded in certain parts. There is now a visitor center. Some areas within the park are closed to vehicles. The photos in this gallery date back to the late 1960s and extend to present time. Pipe Springs. Photo taken in 1970, this was one of the very few places in the area to get water.